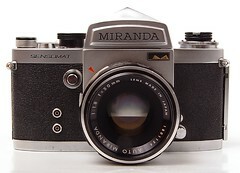 After you have been collecting cameras for a while and your friends get wind of it, as they are cleaning out their closets or basement they might put something in a crumbling leather case aside to give you. 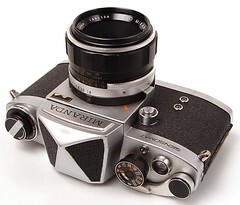 This is one of those cameras I was happy to receive. Launched in 1969, the Sensomat had TTL CdS stop-down meter built in under mirror; an advanced feature for its day. 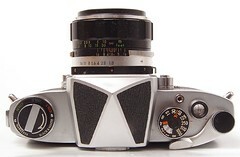 The meter is operated by the two buttons next to lens throat. 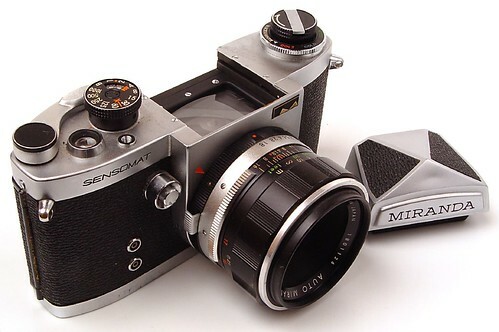 At the time it was known as the poorman's Nikon F as it sported a removable prism like the F. The Sensomat sold reasonably well as a budget SLR during the 70's. Unfortunately, in my example the second shutter curtain is dragging horribly and will require some work before I can put film through it with any confidence.